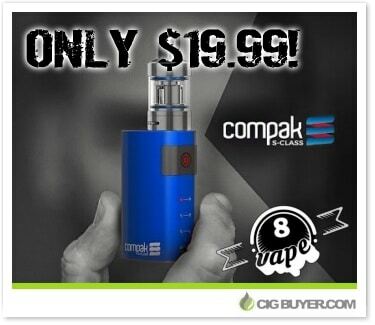 If you’re looking for something super compact and portable, US vendor Eight Vape has just reduced the Sigelei Compak S-Class Starter Kit to only $19.99. That’s nearly half the price of most vendors! Featuring a direct voltage output system that ranges from 20 to 40W (depending on coil), the Sigelei Compak S-Class Kit features simple, one-button operation with aluminum alloy construction, a built-in 2000mAh battery, battery indicator light and 2A micro-USB charging. It comes with a top-filled, 2ml Compak S-Class Tank that includes bottom adjustable airflow and 0.2 ohm SS316 coils.